In February–March 2017, a trial excavation was conducted at the Nahal Zanoah site (Permit No. A-7919; map ref. 200444–884/624494–544; Fig. 1), prior to construction. 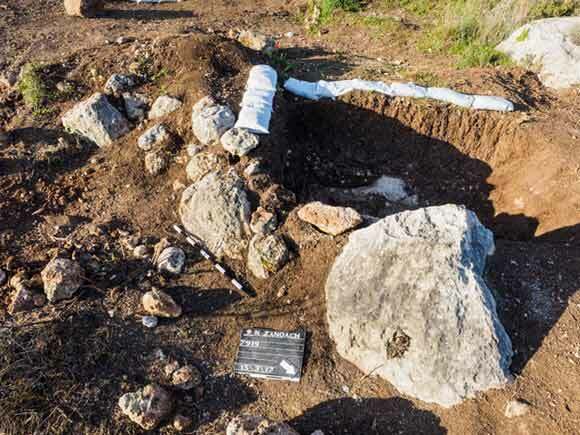 The excavation, undertaken on behalf of the Israel Antiquities Authority and financed by the Yesodot Tzur Company, was directed by O. Shalev (trial trenches), with the assistance of N. Nehama (administration), I. Radashkovsky and D. Levi (GPS), S. Gendler (metal detection), M. Kahan (surveying and drafting), A. Peretz (field photography), A. Weigmann (aerial photography and photogrammetric documentation), N. Ben-Melekh (soil samples), A. Rose (photogrammetric plans), T. Gonen (pottery restoration), I. Raznisky (metallurgical laboratory), I. Lidsky-Reznikov (drawing of finds), D. Sandhaus (ceramics), T. Winter (glass), R. Kool (numismatics), A. Shadman, Y. Zelinger and Y. Paz (scientific consultation). The site extends along a rocky hillside that descends to the northeast at the eastern edge of the Judean Shephelah, about half way from Nahal Zanoah at its highest point and c. 1 km south of Tel Zanoah. 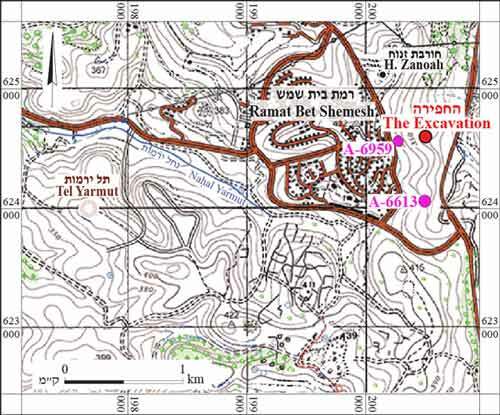 The site was documented in the survey of the Map of Nes Harim (Weiss, Zissu and Solimany 2004:70–71, Site 116) and in the survey of Ramat Bet Shemesh (Dagan 2010:210, Site 261). 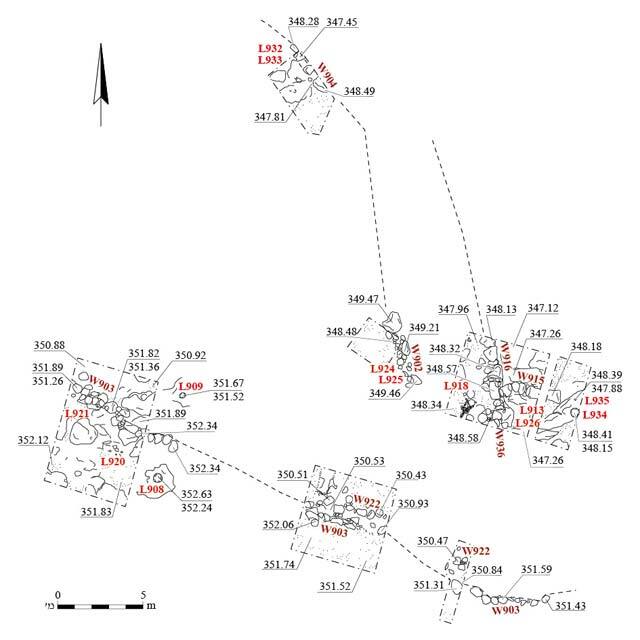 In a comprehensive survey performed prior to future development (Nagorsky 2008: Site 20), the area of the site was identified as a ruin surrounded by agricultural installations and burial caves; the site was consequently removed from plans for future construction. 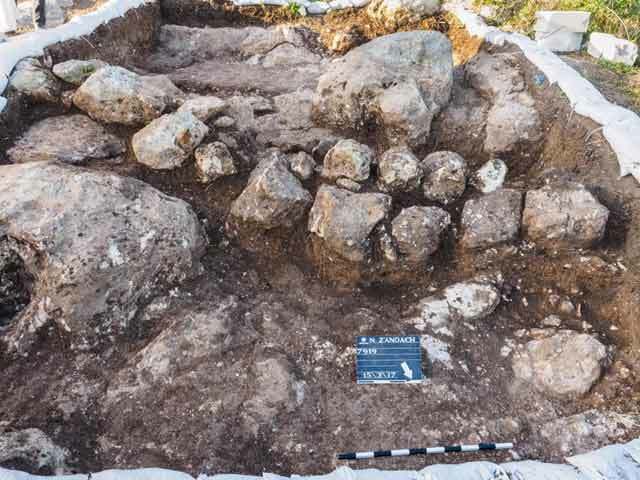 In 2013–2014, extensive excavations were conducted in both the site’s settlement and in its agricultural area (Permit Nos. A-6912, A-7148). 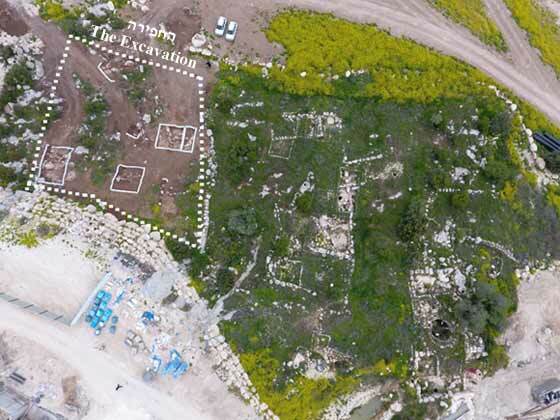 These indicated that that the site is a small rural settlement, surrounded by a wall and inhabited mainly from the end of the Hellenistic period (Hasmonean dynasty) until the Early Roman period (about the first century BCE until the first century CE). 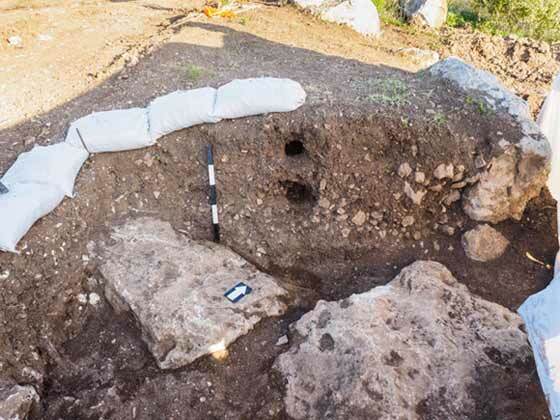 Excavations previously conducted in the declared area of the Nahal Zanoah site revealed a structure from the Byzantine period, west of the current excavation (Permit No. 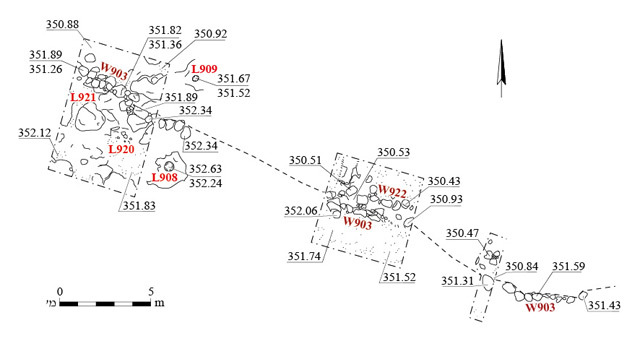 A-6959), as well as an ancient road and agricultural installations scattered south of it (Be’eri 2014). The current excavation area was located outside the ruin, adjacent to the wall delimiting it on the northwest of (Figs. 2, 3). 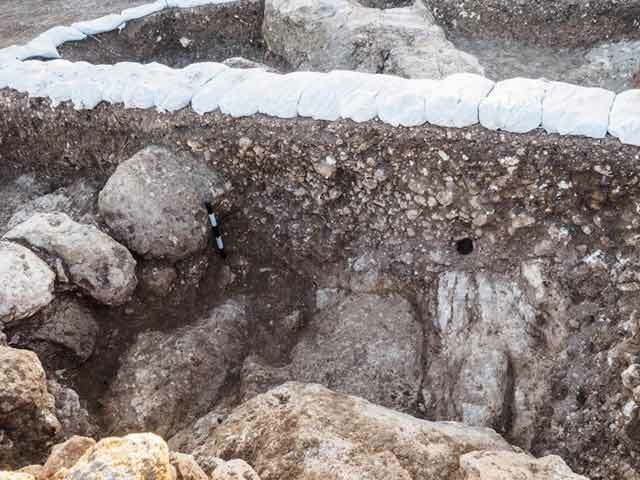 Excavation points were opened in accordance with the findings revealed in preliminary trial trenches. 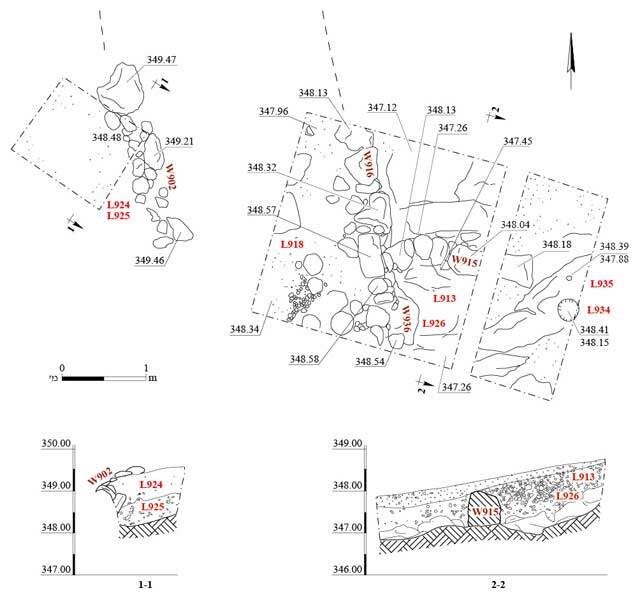 Several field walls (W902–W904, W915, W916, W922, W936) were documented and excavated alongside three basins hewn in bedrock surfaces (Fig. 4). Most of the pottery sherds recovered from the fills at the base of the field walls date from the end of the Hellenistic period to the Early Roman period, the main periods represented at the site. Several sherds from later periods, a few glass finds and coins were also found. The remains are herein described from south to north. Walls 903 and 922. A long field wall (W903; length 33.5 m; Fig. 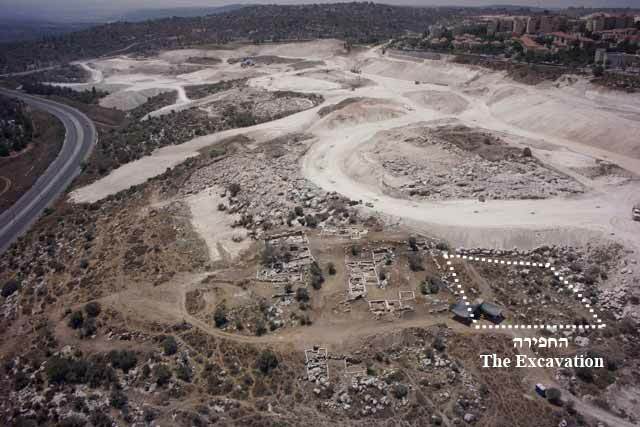 5) which traversed the entire width of the area was exposed in the southern part of the excavation. The wall, built across the slope of the hillside, retained a wide farming terrace to its south. 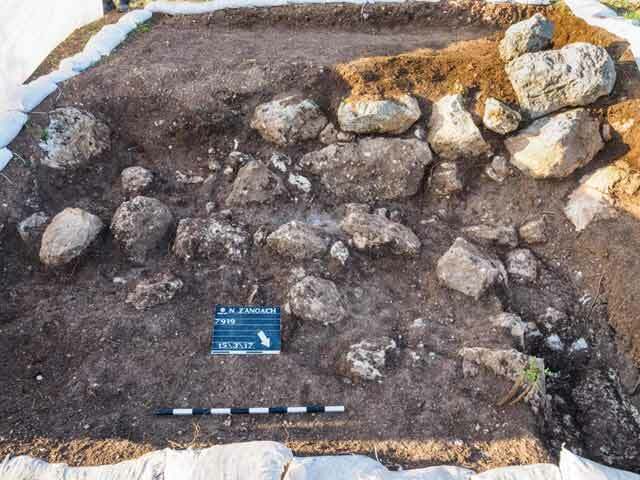 The excavation took place in three places along the wall: a small trial trench beside the eastern part of the wall and two excavation squares beside the central and western parts of the wall. These probed showed that the wall was built of a single row of large fieldstones, placed somewhat carelessly alongside one another with a fill of soil and small stones in between. The wall was preserved to a maximum height of 1.2 m in the central square, where it was built of three courses constructed diagonally against the slope’s inclination (Fig. 6). Only two courses were preserved in its western part. It is possible that the upper of the two courses, built of smaller fieldstones (Fig. 7), reflects a second construction phase, although no material difference was discerned between the fills abutting the two courses. 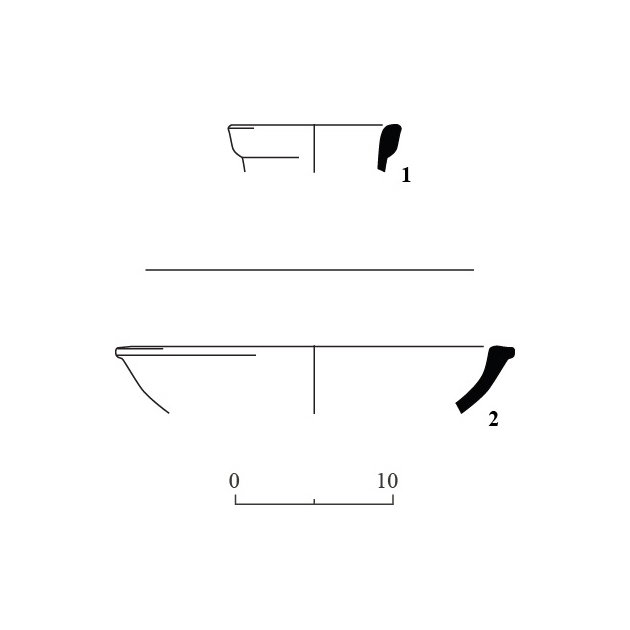 The pottery vessels discovered in the fill above W903 included bowls (Fig. 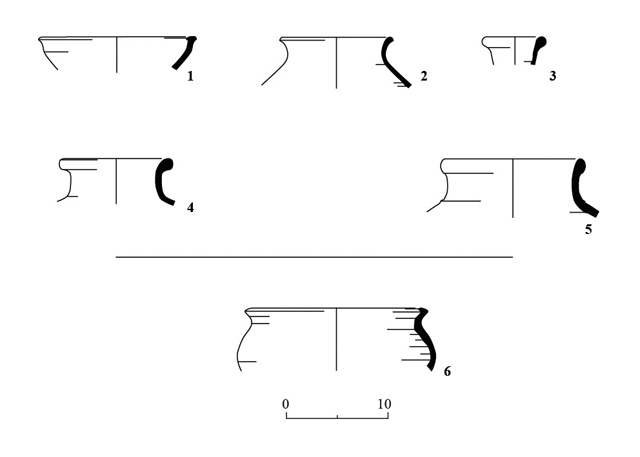 8:1), cooking pots (Fig 8:2), jugs (Fig. 8:3) and jars (Fig 8:4, 5), all dating from the late Hellenistic period (second–first centuries BCE), along with bowls (Fig. 8:6) and other vessels from the Early Roman period (first century BCE–first century CE). These vessels constitute a terminus post quem for the construction of the wall. A second field wall (W922; length 11.5 m; Fig. 5) was identified at the foot of W903; it too was built of a single row of fieldstones, haphazardly arranged side-by-side and preserved to a height of one course. It seems that the wall was built in conjunction with W903 above it, possibly to support the terrace retained by the three courses of W903 and reduce its height. This is suggested by the lack of any evidence for a lower wall in the western part of the area, where the terrain is more moderate. However, one cannot rule out the possibility that the walls were built at different times, although their order of construction remains unclear. 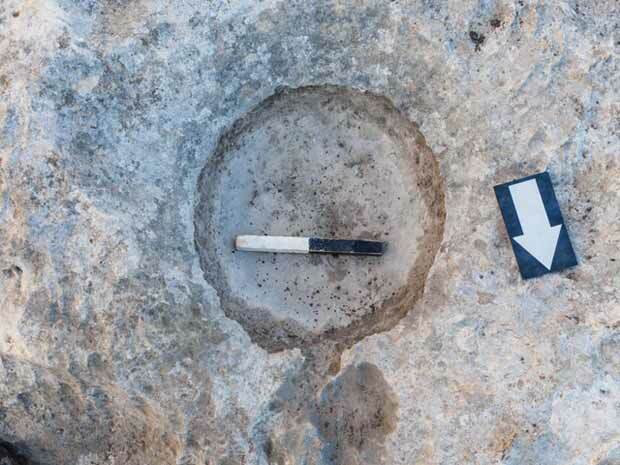 Two basins hewn in the bedrock surfaces were documented in the western excavation square, near W903 (Fig. 5): one on the agricultural terrace south of the wall (L908; diam. 0.55 m, depth 0.35 m; Fig. 9), the other at the foot of the wall, to its north (L909; diam. 0.35 m, depth 0.2 m; Fig. 10). Wall 902. An additional broad agricultural terrace was formed by the construction of W902 (length 11 m; Figs. 4, 11, 12). Two construction phases were discerned in a trench alongside the wall (Figs. 11: Section 1–1; 13). In the early phase, a wall was built of a single row of boulders arranged carelessly alongside each other. A fill (L925) of reddish brown soil mixed with white material (crushed chalk? phytoliths?) and a few small stones was laid along the wall that delimits the higher side of the terrace. In a later phase, a fieldstone fill and a layer of dark brown soil (L924) were added alongside the wall, between the upper parts of the boulders. The excavation alongside the wall yielded only a few ceramic artifacts. Jars (Fig. 14:1) dating from the late Hellenistic – Early Roman periods (first century BCE – first century CE) characterized the early phase, indicating that this phase was not constructed prior to the first century CE. Gaza Ware bowls (Fig. 14:2) found in the later fill suggest that the Ottoman period constitutes the terminus post quem for the construction of this phase. Walls 915, 916 and 936 (Fig. 11, 15). Large fieldstones characterized the construction of another wall (W916), of which only a very short section was clearly exposed. Nevertheless, it seems to be a long field wall (c. 16 m) that runs parallel to, and east of, W902 (Fig. 4). The southeastern end of W916 was abutted by an additional field wall (W915; length 3.6 m, width 0.7–0.8 m, height 0.6–0.7 m). Wall 915, which abuts a bedrock outcrop on the east, was built of large, roughly hewn stones, unlike most of the walls that were documented in the area. Another wall (W936; length 1.8 m, width 0.5 m, height 0.5 m) was similarly built of hewn stones and adjoined W916. Walls 936 and 916 may have been one continuations wall, although the differences in their construction methods—hewn stones versus large fieldstones—seem to suggest that these are separate walls. Since both W915 and W936 were built of hewn stones and since they both abutted the southeastern end of W916, it seems that they were constructed together. 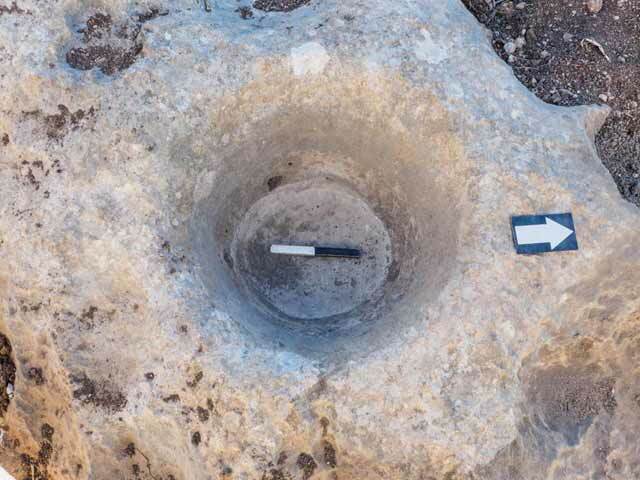 An intentional fill (L913, L926) characterized by a very large quantity of small stones (Figs. 11: Section 2–2; 16) was excavated above W915. This fill, like the construction of the wall below it, seems to have been arranges in a much more meticulous and elaborate manner than the other fills documented in the excavation. Despite the effort put into the construction of Walls 915 and 936 and the stone fill, these walls do not seem to be part of a structure or an installation; nevertheless, these walls and W916 seem to have formed a small enclosure used for some sort of agricultural purpose. Judging by its small area, it was presumably an agricultural terrace meant for planting a single tree or perhaps a small field tower. The pottery sherds recovered from this fill include jugs (Fig. 17:1, 2), jars (Fig. 17:3) and other vessels that were dated to the Hellenistic period (second–first centuries BCE), together with cooking pots (Fig. 17:4), jars (Fig. 17:5) and other vessels from the Early Roman period (first century BCE–first century CE). In addition to these vessels, a bow-rimmed bowl (Fig. 17:6) was found that was prevalent mainly in the Late Roman and Byzantine periods. However, it has recently been argued that the earliest appearance of this type of bowl dates to the end of the first century CE or the beginning of the second century CE (Rosenthal-Heginbottom 2014). This sherd, which is the latest find in the assemblage, provides a terminus post quem for the construction of W915. A rock-hewn basin (L934; diam. 0.55 m, depth 0.3 m; Figs. 11, 18) and an adjacent cupmark (L935) were unearthed east of these walls. Wall 904. Another long field wall (W904; length c. 15.5 m; Fig. 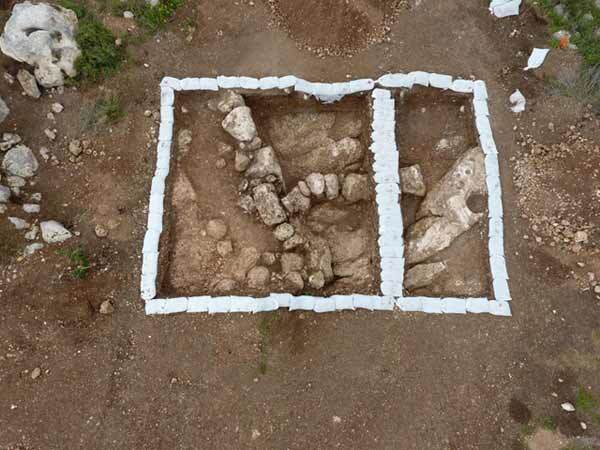 19) was uncovered in the northern part of the excavation area; a probe was excavated beside it. The wall was built of a row of boulders, haphazardly arranged alongside each other, forming a broad farming terrace to its southwest. A fill (L933; Figs. 19: Section 1–1; 20) of light brown soil and small stones, overlain with topsoil, was discerned alongside the wall. 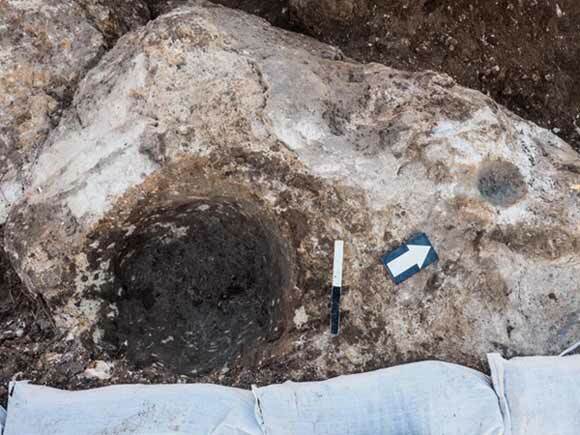 The ceramic finds recovered from this fill included jugs (Fig. 21:1, 2) and jars (Fig. 21:3) dated to the Hellenistic period (second–first centuries BCE), together with bowls (Fig. 21:4) from the Early Roman period (first century BCE–first century CE). These items provide a terminus post quem for the construction date of W904. Four coins and four glass fragments were found in the excavation. The earliest coin is from the reign of the Seleucid ruler Antiochus IV (173–168 BCE; IAA 161197; Fig. 22); it is bronze, and has jagged edges. Such coins were struck in huge quantities at the ʽAkko-Ptolemais mint, and tend to appear in archaeological contexts that are later than the second century BCE. 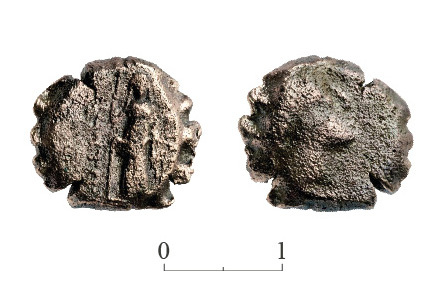 Three Hasmonean prutot were also discovered, two of which were minted towards the end of the reign of Alexander Jannaeus (80/79–76 BCE; IAA 161198, 161199). All four coins were found devoid of archaeological contexts (on the surface, in natural accumulations and in the excavation debris), but are identical to those discovered in the excavations at the ruin (Permit Nos. A-6912, A-7148): 89 coins, c. 80% of which are identical Hellenistic coins and Hasmonean prutot. The coins assist in dating the earliest settlement at the site. Of the four fragments of glass found, only one, a vial rim (not drawn) dating from the Late Roman period to the Byzantine period, was identified. Since this item was found in a natural soil accumulation at the foot of a field wall, it contributes little to our understanding of the finds at the site. The excavated area was adjacent to a rural settlement, most of which dates from the end of the Hellenistic period and the Early Roman period (first century BCE – first century CE). The excavation yielded agricultural field walls and simple rock-hewn installations, which substantiate the supposition that the settlement had an enclosure wall to the west. It is possible that the differences in the way the walls were constructed and in the fills at their base reflect the chronological differences between the walls, their functional differences or both. Only in W902 can two construction phases be clearly identified, along with two separate fills, each adjoining one of the construction phases. The stratigraphic relationship between Walls 915 and 936 was identified with certainty at only one spot; since both abutted W916, they postdate it. The majority of pottery sherds from the fills alongside the terrace walls date from the Hellenistic period (second–first centuries BCE) and Early Roman period (first century BCE – first century CE); they also included several items from later periods. A similar picture was derived from the excavations in the nearby settlement, even though numerous vessels from earlier and later periods were found in fills and natural accumulations throughout the site. 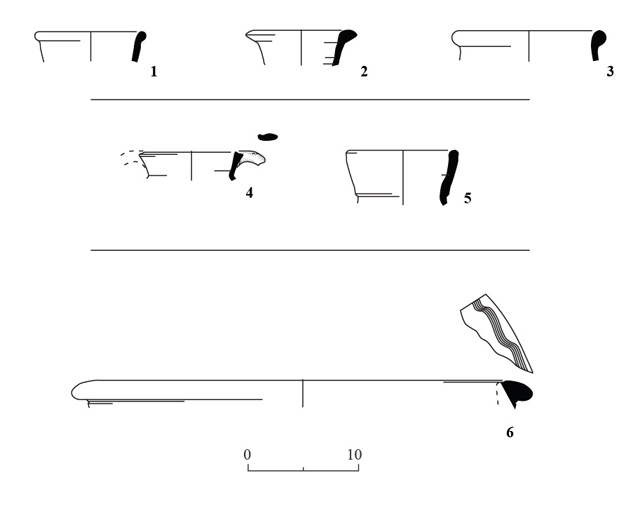 However, the sherds were found in fills alongside terrace walls, in a secondary archaeological context, and can at most provide a terminus post quem for the construction of the walls. Since soil from archaeological sites is rich in organic material and good for fertilizing agricultural fields (Miller and Gleason 1994:27), it is quite possible that the field walls were built years after the settlement was abandoned. 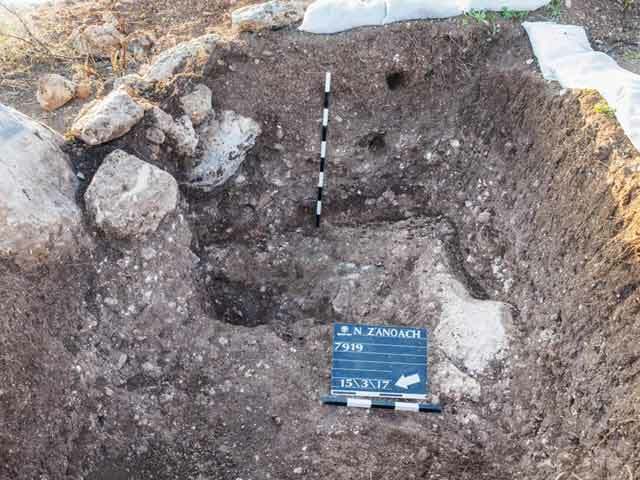 In seeking absolute dates, soil samples taken near three field walls were sent for OSL analysis; the results will be examined in a comprehensive study of the agricultural activity in Ramat Bet Shemesh to be published by Y. Paz. The three long field walls (W902–W904), which form broad agricultural terraces, were apparently part of the ruin’s agricultural hinterland and were probably built when the settlement was at the peak of its prosperity. This conclusion is corroborated by the pottery sherds found in the fills at the bases of these walls, since none are later than the first century CE. The area was used for agricultural over long periods of time, as indicated by Walls 915 and 936, erected at the earliest in the first century CE, and by the second phase of W902, which was probably built in the Ottoman period. Upon completion of the excavation, the archaeological remains were demolished (under close supervision), and the area was released for construction. Miller N.F. and Gleason K.L. 1994. Fertilizer in the Identification and Analysis of Cultivated Soil. In N.F. Miller and K.L. Gleason eds. The Archaeology of Garden and Field. Philadelphia. Pp. 25–43. Rosenthal-Heginbottom R. 2014. Dating the Jerusalem Rilled-Rim and Arched-Rim Basins. In N. Poulou-Papadimitriou, E. Nodarou and V. Kilikoglou eds. Late Roman Coarse Wares, Cooking Wares and Amphorae in the Mediterranean: Archaeology and Archaeometry – The Mediterranean: A Market without Frontiers. Oxford. Pp. 657–664. Weiss D., Zissu B. and Solimany G. 2004. 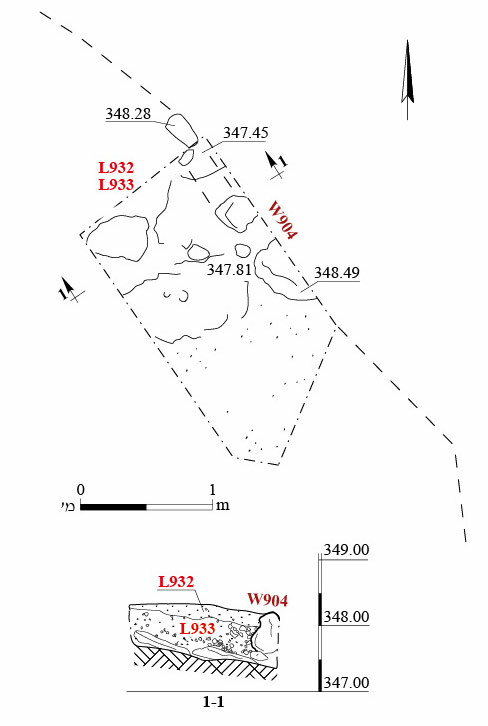 Map of Nes Harim (104) (Archaeological Survey of Israel. Jerusalem. 2. The excavation area and the ruin, aerial photograph at the end of the 2014 season, looking southwest. 3. The excavation area and the ruin, aerial photograph at the end of the 2017 season, looking north. 5. Walls 903 and 922 and nearby installations, plan. 6. Walls 903 and 922, looking southwest. 7. Wall 903, looking southwest. 8. Pottery from the fill above W903. 9. Basin 908, looking west. 10. Basin 909, looking south. 11. 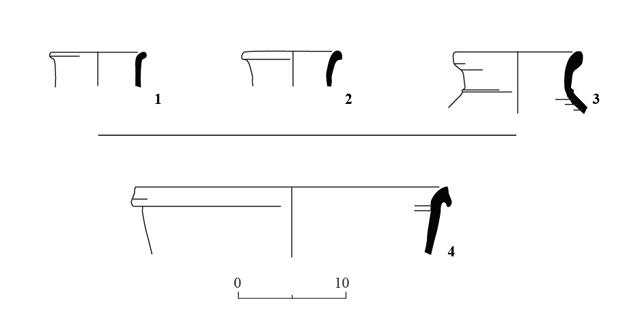 Walls, a basin and a cupmark, plan and sections. 12. Wall 902, looking southwest. 13. Two soil fills abutting two different phases of construction in W902, looking east. 14. Pottery from the fill above W902. 15. Walls 915 and 916, looking northeast. 16. Intentional filled beside W915, looking east. 17. Pottery from the fill above W915. 18. Basin 934 and nearby Cupmark 935, looking west. 19. Wall 904, plan and section. 20. Intentional fill alongside W904, looking northeast. 21. Pottery from the fill above W904. 22. A coin of Antiochus IV.